Within the William Wallace National Monument is the "Hall of Heroes" containing busts of sixteen well known Scots. The entire group is not perhaps the "top 16" on everyone's list but the selection does reflect the views of the individuals and organisations of the 19th century views who presented them for display in the Wallace Monument. A number of these heroes are included in the other pages of this feature on Famous Scots but the links below are to external sites. Sir David Brewster (1781 - 1868), scientist and inventor. Robert the Bruce (1274 - 1329), King of Scotland and national hero. George Buchanan (1506 - 1582), historian and scholar. Thomas Carlyle (1795 - 1881)writer and sage. Thomas Chalmers(1780 - 1847), preacher and writer. William Ewart Gladstone (1809 - 1898), politician and UK prime minister. John Knox (1505 - 1572), religious reformer. David Livingstone (1813 - 1873), missionary and explorer. Hugh Miller (1802 - 1856), writer and geologist. William Murdock (1754-1839), pioneer of gas lighting. Allan Ramsey (1685 - 1758), poet and man of letters. 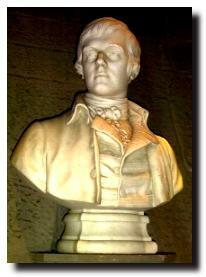 Sir Walter Scott (1771 - 1832), writer, poet and nationalist. Adam Smith (1723 - 1790), economist and philosopher. Robert Tannahill (1774 - 1810), songwriter. James Watt (1736-1819), inventor and developer of the steam engine.